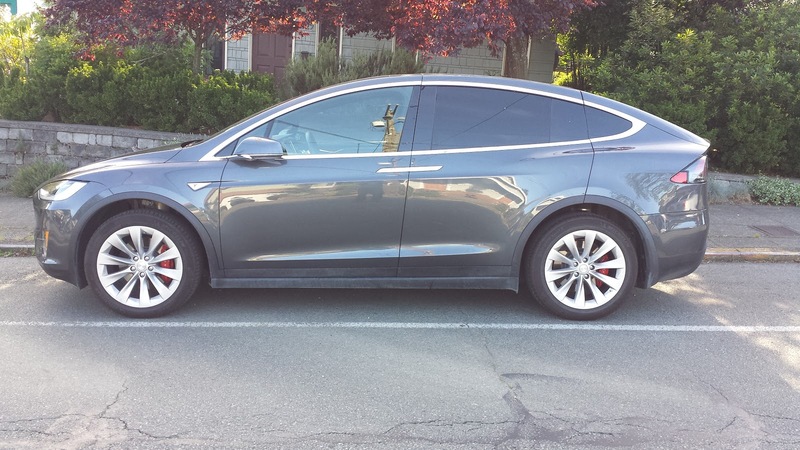 BIODIVERSIVIST: Is the Tesla Model X the Hummer of electric cars? Another Tesla goes up in smoke. I've written about some of the other incidents here and here. When I built my electric bicycle back in 2007, I had been waiting for a battery that was less volatile than what had been available. I didn't want to risk having a fireball under my seat. Tesla traded volatility for power density. I think electric cars are great for all kinds of reasons, which is why I bought one in 2011. But like any car, they are not created equal, and as marketers begin the process of differentiating them to get us to buy them, that inequality will grow and diversify as it has for conventional cars. And for any fellow electric car enthusiasts out there who think electric cars are going to make a significant dent in carbon emissions in the foreseeable future, read Robert Rapier's article on that subject. Even a strongly biased study by the UCS shows that electric cars, on average, presently produce about half of the emissions of conventional cars in a cradle-to-grave analysis. Eliminating fossil fuels (instead of nuclear) from our energy mix will improve that over time. 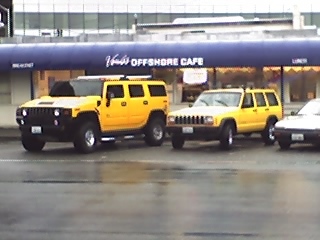 ...I spotted a yellow Hummer parked next to a yellow Cherokee (the original SUV) the other day. The contrast was startling. Status seeking has a natural tendency to escalate. You know the end of a fad is near when it finally spawns a ridiculous monstrosity like the Hummer. That’s right. I actually saw a Hummer pulling a trailer with stuff in it yesterday. Although stunned, I recovered in time to get a shot of his trailer as he pulled away from the transfer station. 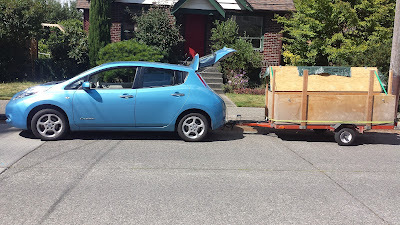 Coincidentally, I was also pulling a trailer on my bike (also visible in the lower right hand corner). We smirked at one another as we passed. That same year I wrote another article that was reposted at Auto Blog with a slightly different title: Prius snob challenges data that shows hybrids, Hummer have same lifetime energy consumption. He (me, the Prius snob) accepts that a hybrid such as a Prius (shown being assembled in Toyota City, Japan) would use more energy during its lifecycle, given that CNW has placed its lifecycle at 109,000 miles while giving SUV 197,000 miles. In my article I pointed out that it was the assumption that a Prius would only be driven 109,000 miles that made it seem worse than a Hummer. It's true that you would have been lucky to get that many miles out of a Pinto. 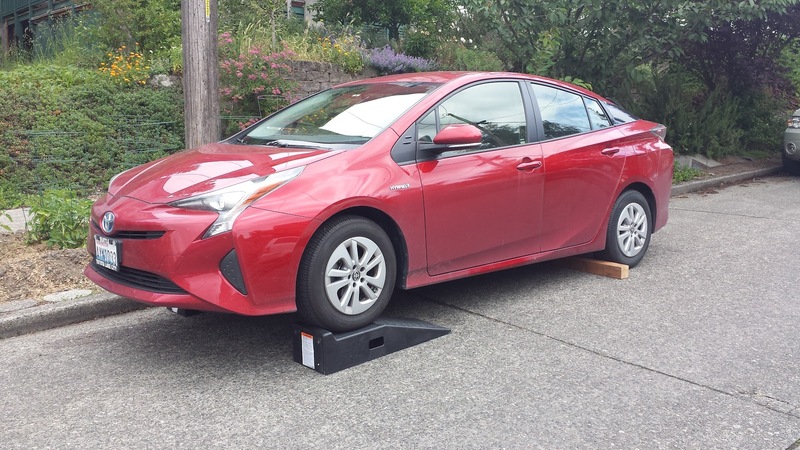 I was highly skeptical that a Prius, with assistance from an electric motor, would last no longer than a Pinto. Earlier this year Consumer Reports listed the Prius as one of the 10 Best Cars to Get to 200,000 Miles and Beyond. The Hummer brand has been discontinued. A lot has changed in the decade since I wrote those articles, human nature, not so much. For all Americans, charging the average new EV produces far fewer global warming pollutants than driving the average new gasoline car. Although not mentioned in the study, another conclusion that can be drawn from their results is that when it comes to carbon emissions per mile, a Prius is presently as good or better than an electric car in most states. It's time we stopped comparing apples to oranges. If a Hummer is less environmentally benign than a Cherokee, then a Tesla Model X is less environmentally benign than a Leaf. (1)Standard 2WD pickups sold in 2016 average 18.7 mpg. The average car sold in 2015 gets 25 mpg. 2016 2WD standard pickups emit 34% more carbon emissions per mile than the average car.